The 17th-century was a time of great social, political, and moral upheaval. 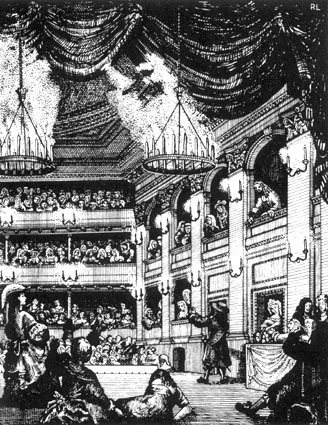 In 1642, the theatres were closed. In 1649, the world turned upside down: a king was beheaded, a republic established, the English Church was shut down (though religion still ruled with an iron fist), and the theatres, which had been closed for seven years, would remain shut down for over a decade. In 1660, the world turned upside down again. A king once again sat on the throne of England, the Church was reestablished, and a looser morality ruled the day. The theatres were reopened. For the first time in English history, women played the female parts onstage, and the tastes of the audience ran to the wild side. The stage of the late 17th-century is bawdy, entirely disrespectful of conservative moral and social tastes, and thoroughly enjoyable. Unfortunately, as with all carnivalesque (think Mardi Gras) forms of behavior, the Restoration stage (especially its comic stage) was all too brief a phenomenon. Soon, the forces of decency and even—gasp—censorship, reasserted themselves, and the libertine characters of the late 1600s soon enough become the sentimental (oh so goodhearted) characters of the 18th-century. This class will give you an overview of 17th-century history and theatrical controversies, and along the way, we will read a number of good plays. Each student will do 3 assignments. 1) Group assignment: You will each be asked to sign up for the play you are most interested in working with in greater depth this quarter, and you will focus your group presentation on this play. By the end of week 3, I will ask you to sign up into groups of three to five apiece (the numbers will depend on enrollment). When your group's play is up that week, you will make an eight to ten minute class presentation on a cultural or historical topic related to the play (feel free when making the presentation to use audio or visual material to help the rest of us follow along). You will also choose, rehearse, and perform a five to six minute scene from the play for the class and discuss that scene’s significance and their performance choices--bring any necessary props to class on the day of your group's scene (props and hamming it up a bit can make this more fun for everyone). It will be up to each group to decide who participates in which of the two portions of their presentation, but everyone must participate in one or the other. Excellent sources for journal articles (for the research portion of the presentations) include JSTOR (http://www.jstor.org/), Project Muse (http://muse.jhu.edu/), and Academic Search Elite (http://library.csun.edu/restricted/ebsase.scr). These databases must be accessed from the CSUN campus, or from off-campus with your activated library card bar code ID and last name.